As you spend lots of money on ski equipment, ski pass and else for sloping, it is also a worthy investment to have top-notch tuned skis. If you have decided to purchase a complete ski wax kit but don’t know which to go for, then keep on reading. The pros of buying a complete ski tuning kit compared to buying separate parts is that the components will fit nice in the contained bag, fill all the functions you need and be delivered at the same time . The downside is that you can’t select and style the set into what will fit your ski or boards the best. As with everything, there are products in all price ranges. You could just invest in a simple set containing each of the featured items and in that way save money. However, if you are a detail-oriented person who prioritize good performance, you will most likely end up upgrading almost all of the tools from the simple set. Therefore, it might be worth to instead invest in a high quality ski wax kit. I will start off with a cost-effective ski wax kit. 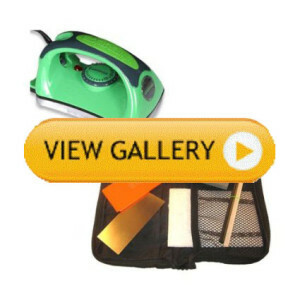 It is the absolute basic One Ball Jay Hot Wax Kit, containing one 120V waxing iron with adjustable temperature of 100 °C to 160 °C (212 °F – 320 °F). Including one hot- and one rub on wax as well as a wax scraper and a few accessories. In my opinion, it is a very good package for what you pay. However remember that you are waxing your skis for a purpose; to obtain higher speeds in the slopes. By using a professional ski tuning kit compared to this basic you will feel notable change in speed. 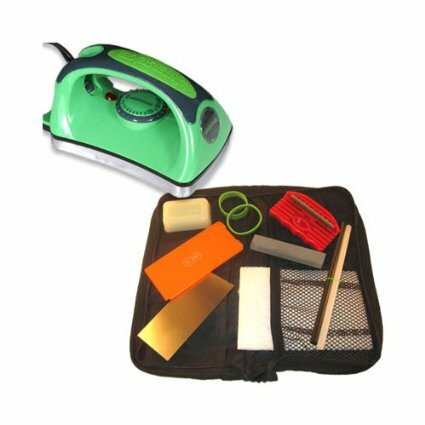 In the picture to the left is the highly recommended RaceWax Tuning Kit RA-4710, which includes a smart 800W waxing iron with a thick sole plate. It has a steady adjustable temperature between 100 °C – 210 C° (212 F° – 410 F°) as well as an all temperature wax bar, a five inch scraper and a 2° edger. Including instructions for the iron. The kit basically contains all the tools you need for high quality tuning. The top notch ski wax kit of 2015/2016 season is the Dakine’s Super Tune Ski Wax Kit. A multi pocket case containing all useful tools for repairing and tuning your skis or snowboard. Adjustable temperature tuning iron, edger, metal- and wax scraper, all temperature wax and a lot more quality products. Once you get pro on tuning, you will probably end up replacing an item or two from this kit, but this is definitely a great ski tuning kit as it comes delivered both for the new and the more experienced tuner. Remember that when you use this World Cup kit, don’t tell your friends about it or you might end up ironing and scraping your friends’ skis all night long. The creators of this website has for a long time been helping skiiers maxing out their ski expereince. That is done with professional ski tuning tips, as for instance to always use a different wax for each different weather condition. This website will be like your virtual ski tuning guidebook and by browsing the full website. you are guaranteed to have all your questions answered! What is your number one general skiing tips? Always tune your skis gently before hitting the slopes. Aswell as always stay safe and have the right gear to be prepared for the unprepared. What ski wax equipment should I invest in? Read the reviews to find out what you need! What are, from your point of view, the best skiing spot in the world? That depends on what type of skiing you are looking for. As for ski resort I would say Whistler BC in Canada which has a really huge and challenging system. For backcountry skiing and heli skiing I would say Valdez in Alaska. Are you willing to beta test a product of mine? I am always open for suggestions, please contact me!